Whether Prvić was named for the ancient Slavonic god of spring or the population named it for its proxymity to that town ("prvi" meaning "first") is hard to say nowadays. What is certain is that Prvić holds a treasure of cultural wealth on its small area. It only takes some two hours of easy strolling to make a roundabout circuit of the entire island. Prvić Luka and Šepurine, the island's only towns, reenact ancient Mediterranean scripts with its stone streets, its murmuring waves and its crickets' serenade. The vibrant nightlife of Vodice is only a short ferry ride away, and the early morning line could have been tailor-made for homebound party people. 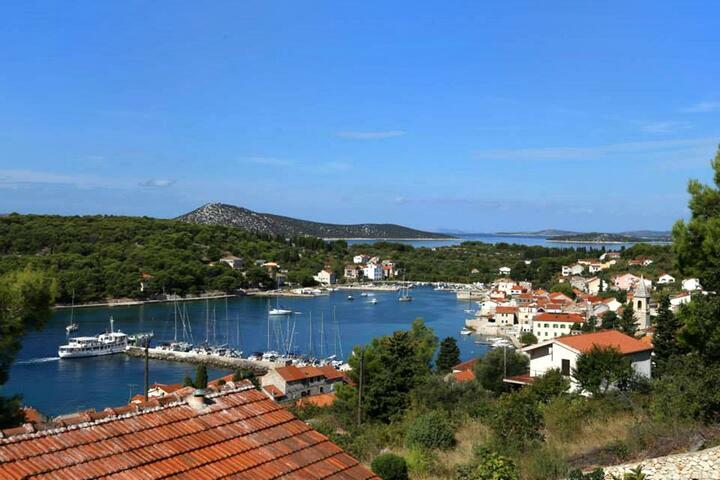 The first sight a visitor gets of Prvić island is the line of centennial stone houses. Traditionally sharing a dividing wall as a material-saving strategy, the entire complexes have been declared protected cultural heritage as a unit. A number of them host art colonies today, while others are cozy taverns, serving delicious specialties accompanied with home-made brandy or dried figs prepared in accordance with the island's traditional recipes. Although Prvić was already settled in antiquity, which period has left numerous remains, it was only in the fifteenth century that its population was increased by those seeking to escape Turkish raids. It was in this period that the monastery and its church of Our Lady of the Graces was built, while that of Saint Roche was completed in the seventeenth century. The latter houses a richly decorated wooden altar. Prvić island made an indelible impression on the childhood of scientific polymath Faust Vrančić, or Fausto Veranzio. This Renaissance man in the truest sense of the word used the island's cliffs and bell towers to try out his parachute designs. The models of this and numerous other of his many brainchildren are today exibited in the Faust Vrančić museum in Prvić Luka. Excited by the island's undeniable magic, Faust Vrančić chose the town of Šepurine as the site of his summer palace. It is the only such aristocratic residence that survives today. In obeyance of his dying wish, he was buried in the church of Our Lady of the Graces in Prvić Luka. The spontaneous seeking of bragging rights among the islands of the Šibenik archipelago have over the years given birth to a sports entertainment spectacle known as Bodulska pripetavanja, or the Island tie-breakers. In July and August, Prvić hosts soccer, waterpolo and card playing competitions, but the central event is the rope pulling contest. Fireworks close the proceedings, and the many nights of musical entertainment will give the visitors a chance to fall in love with traditional Dalmatian choral singing. The old traditions of Prvić are renewed every August the Second for the feast of Our Lady of the Angels and on the sixteenth for that of Saint Roche. This event is followed by the Burtiž - a regatta of traditional boats with Latin sails.